open the RushCard mobile app (standard text message and data rates, fees, and charges may apply) and select "Activate Card" option and enter your card number, CVV, SSN, and PIN. visit account.rushcard.com and select "Activate Your Card" and enter your card number, CVV, SSN and PIN. call the phone number on the sticker on the front of your card and set your PIN. Then, fund your RushCard. At a minimum, you must add enough money to pay your One-Time Card Fee ($3.95 or $9.95, depending on the card design you choose). Watch our Activate Your RushCard video to learn more. Watch our Create an Online Account video to learn more. What are the fees for using a RushCard? Click here to see our complete list of fees. Account Number: Your Deposit ID Number which you can get here or by texting DD to 697874 (if enrolled in text alerts) or selecting "Set up Direct Deposit" in the mobile app (standard text message and data rates, fees, and charges may apply). What if my RushCard is lost or stolen? To report your lost or stolen card, immediately call a Customer Service Agent at 866-RUSHCARD (866-787-4227) so that we can cancel the card and issue you a new one. You will receive your new card within 5-7 business days. A Replacement Card Fee of $5.00 may apply. See Cardholder Agreement for complete details. 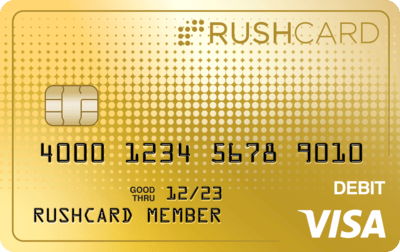 Is it safe to use the Prepaid Visa RushCard for online purchases? Yes. Your Prepaid Visa RushCard can be used at thousands of online retailers (including airline and hotel reservations) and is protected with the Visa Zero Liability policy7. Please note your RushCard CANNOT be used at online gambling sites. Go to Forgot Username/Password in the RushCard mobile app18 (standard text message and data rates, fees, and charges may apply) or at account.rushcard.com. Provide your 16-digit card number, CVV code, and Social Security number. Follow the instructions to reset your Login ID and/or Password. Please contact a Customer Service Agent at 866-RUSHCARD (866-787-4227) to request a replacement card. A Replacement Card Fee of $5.00 may apply; see Cardholder Agreement for details. Your replacement card should arrive in 5-7 business days from the day it was mailed. If you do not receive your RushCard within that time period, contact a Customer Service Agent at agent@rushcard.com or 866-RUSHCARD (866-787-4227) to make sure that the address we have on file for you is correct. call our toll-free number 866-RUSHCARD (866-787-4227) for a customer service rep to assist you. What if I misplaced my RushCard and want to temporarily pause my card? If you misplaced your card, you can use RushCard Pause Protection to temporarily prevent new purchases to your RushCard. Withdrawals and debit transactions conducted using your card will not be authorized. Some activity will continue, including debit transactions that were authorized before you Paused your account, transactions crediting funds to your account, ACH debit transactions conducted using your account and routing numbers, debits or credits applied by RushCard Customer Service Agents, and recurring bill payments. To Pause your account, login to the RushCard mobile app (standard text message and data rates, fees, and charges may apply) and select "Pause Card".When you find your RushCard, select "Resume Card" to restore your RushCard instantly.To report your lost or stolen card, immediately call RushCard Member Services at 866 - RUSHCARD(866 - 787 - 4227) so that we can cancel the card and issue you a new one.See Cardholder Agreement for complete details. What do I do if I forget my secret questions? Login to your account at account.rushcard.com. Go to Account Settings & select Security Questions to change. After clicking ‘Edit Security Questions’, you must select new questions & enter the answer.